Adam Charles Voges (/ˈvoʊdʒɪz/, born 4 October 1979) is a former Australian cricketer who played for the Australian national team at Test, One Day International (ODI), and Twenty20 International (T20I) level, and also captained Western Australia and Perth Scorchers in domestic cricket. Voges' test match batting average of 61.87 is second only to Donald Bradman (among batsmen who have played a minimum of 20 innings). Voges was included in the 2016 ICC Test Match Team of the Year. In February 2017, Voges announced his retirement from international cricket. With an average of 61.87 in 20 Test appearances, he is regarded as one of the great batsmen amongst the ones who had a late debut. His last match was as captain of the Prime Minister's XI side against Sri Lanka on 15 February 2017. The next month, he also announced his retirement from domestic cricket, following the conclusion of the 2016–17 Sheffield Shield season. On 16 October 2017, he re-signed on for 2017–18 Big Bash League season with the Perth Scorchers. 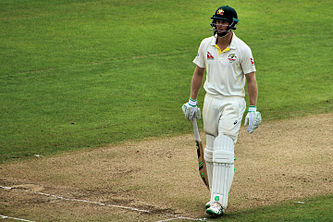 In April 2015, Voges was called up to the Australian Test Cricket squad for the first time in his career for the away Test series against the West Indies and England, respectively. He made his maiden Test century on his debut against the West Indies in Dominica in June 2015. He also became the oldest Test debut centurion, and the oldest player to win a man-of-the-match award on Test debut. His baggy green cap was presented by Brendon Julian. Voges was named as stand-in test Vice-Captain for Australia after David Warner suffered a thumb fracture during the ODI series against England from the bowling of Steven Finn. On 11 December 2015, Voges eclipsed the Bellerive Oval's scoring record, passing Ricky Ponting's record of 209 runs. He then surpassed Doug Walters' record of 242 for the highest score by an Australian against the West Indies. This was also his second century against West Indies. ^ "Adam Voges". cricket.com.au. Cricket Australia. Archived from the original on 16 January 2014. Retrieved 15 January 2014. ^ "Highest Career Batting Average". ESPNcricinfo. Retrieved 24 December 2017. ^ "ICC Test and ODI Teams of the Year announced". International Cricket Council. 31 January 2017. Retrieved 24 December 2017. ^ a b Adam Voges: Australia batsman takes Test average over 100 in New Zealand, BBC Sport, 2016-02-13. Retrieved 2016-03-13. ^ "Voges announces international retirement". ESPN Cricinfo. Retrieved 14 February 2017. ^ "Sri Lankan XI warm up by thrashing PM's XI". ESPN Cricinfo. Retrieved 15 February 2017. ^ "Voges, Doherty and Hartley opt for retirement". ESPN Cricinfo. Retrieved 15 March 2017. ^ "Adam Voges re-signs with Perth Scorchers". Cricbuzz. Retrieved 16 October 2017. ^ Adam Voges player profile Archived 15 October 2012 at the Wayback Machine – Perth Scorchers. Retrieved 9 November 2012. ^ History: 1990s – Melville Cricket Club. Retrieved 9 November 2012. ^ Andrew Miller, Voges looks over his shoulder for call-up, Cricinfo, 8 December 2006. Retrieved 9 December 2006. ^ "www.sitecore.net". Cricket.com.au. Retrieved 30 December 2015. ^ "Australia tour of West Indies, 1st Test: West Indies v Australia at Roseau, Jun 3–7, 2015". ESPNCricinfo. Retrieved 3 June 2015. ^ "Adam Voges scores century on Test debut to rescue Aussies". 9 News. Retrieved 4 June 2015. ^ "'Old man' Voges joins the greats". cricket.com.au. Retrieved 11 December 2015. ^ "WI 91/6 (43.0 ov, CR Brathwaite 3*, DM Bravo 13*, PM Siddle 2/19) – Stumps | Live Scorecard | ESPN Cricinfo". Cricinfo. Retrieved 27 December 2015. ^ Wu, Andrew (13 February 2016). "Australia v New Zealand Test series: Adam Voges bumps average beyond 100, passes Sir Donald Bradman". ^ Seervi, Bharath (24 February 2016). "Runs and records for Australia's top five". ^ a b "West Indies tour of Australia, 2015/16 – Australia v West Indies Scorecard". ESPNcricinfo. 12 December 2015. Retrieved 1 January 2016. ^ a b "West Indies tour of Australia, 2012/13 – Australia v West Indies Scorecard". ESPNcricinfo. 10 February 2013. Retrieved 1 January 2016. ^ "West Indies tour of Australia, 2012/13 – Australia v West Indies Scorecard". ESPNcricinfo. 13 February 2013. Retrieved 1 January 2016. ^ "Twenty20 Cup, 2009 – Yorkshire v Nottinghamshire Scorecard". ESPNcricinfo. 4 June 2009. Retrieved 1 January 2016.